I am hoping that those of you who will be attending the 127th AES Convention in NYC will add a few important items to your ‘must-do’ list while there. 1. Look for me at any of the various meetings or ‘on the exhibit floor’, and please introduce yourself! 2. Approach exhibitors & inquire if they may be willing to come speak to your local section. You’d be surprised how many are anxious for this chance, and just need a little coaxing. Many will offer to do so at little or no cost to your section too! 3. Apply suggestion #2 with those who are presenting papers, workshops, tutorials, etc. There is an amazing array of opportunities for interesting local meetings just waiting at every AES convention. 4. Get acquainted with other ‘specialists’ at any of the Technical Committee or Standards meetings. These are OPEN to all attendees, regardless of membership status. 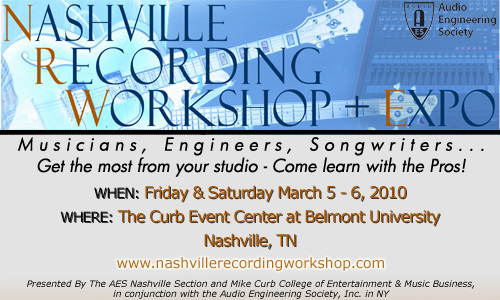 This is a great chance to confer with some of the brightest minds in the audio industry today. A full listing of meeting times is available on-site. 5. Plan to attend & participate in the Regions & Sections Meeting on Sunday 9AM-11AM. Come share your ideas & learn from other section leaders how to make your section’s experience even better. Francis Rumsey, Regions & Sections Chair, will lead this discussion, which will include presentations by Regional VP’s and other section leaders (like yourselves). 6. Don’t miss the Heyser Lecture on Sunday @ 7PM! This year’s distinguished lecturer is the legendary Phil Ramone, who will treat you to his insightful ‘Technology and Music Meet Again”. I am looking forward to seeing (and meeting) you there! Wow… it’s not very often that you can get excited about a new web site, however ‘new and improved’ hardly does it justice! Following many long months in development, the new AES site is simply stunning, and will benefit old, new, and those not quite yet, members with its attractive, informative, and easy to navigate layout. All of these features allow you to find what you are looking for, and discover a few new things, about the AES. Kudos especially to our AES Webmaster, Steve Johnson, and to the volunteers that helped him make this happen: team leader Nick Zacharov, graphic designer Josh Tidsbury, and copywriters Peter Cook and Michael Fleming. This is the premiere, must-see, event for the world’s audio community…the Fall AES Convention in the beautiful Golden Gate City! You cannot afford to miss it…details are available at http://www.aes.org/events/125/. I will look forward to seeing you there at the Regions & Sections Meeting, which is scheduled for Thursday Oct. 2 @ 5:00 PM. More details soon! The 2008 Boston Area Definitive Audio Student Summit on 9.20.2008! Check out ‘Section Highlights‘, featuring exciting news from the AES Webster University Student Section & the newly-developing AES St. Louis Professional Section! See renowned Beatles engineer Geoff Emerick on October 29!!! This is a web site devoted to AES Student Section activities and interests world-wide. You need to check it out… http://www.aes-sda.org/cms/ . There are great articles, tutorials, and forums, along with information about past and upcoming student events at the conventions. This site is developed & maintained by student AES members like you. One special note re: Section Officers & Faculty Advisors…it is important that all of your section’s officers and faculty advisors remain current AES members during their tenure. In addition, it is expected that Faculty Advisors are to be Full Members. You will notice that this info is requested when you make changes to the officer listing. You can easily verify member numbers simply by using the on-line member database, which can be found at www.aes.org/members/. Your Section Contact (typically the Section Secretary) may also access a full database listing of members of your section. This should be reviewed periodically for accuracy so that you are certain of maintaining your section membership. That’s all for now…. I look forward to hearing from you soon!